Flaking (also called spalling) in natural stone is generally an indicator of sub-florescence, a condition in which mineral salts are carried into the stone by moisture and accumulate beneath the stone’s surface, creating stress within the pores of the stone. This condition can be particularly damaging if the stone experiences freeze-thaw cycles, since the moisture and salts will freeze and expand, building up even more pressure within the stone. If spalling progresses too far, the stone will wind up needing to be replaced, so it is best to address the problem as early as possible, by contacting a stone restoration expert to evaluate the stone. They can help determine the source of both the moisture and the salts and offer practical solutions specific to your situation to resolve the problem and help prevent its re-occurrence. Salts can come from many sources. They may be inherent in the stone itself. They can come from the presence of de-icing salts or polluted rain water, from improper cleaning methods, from the setting bed, and even from the soil beneath the setting bed if the installation has not been properly insulated. Lab testing may be required to determine the source of the salts, which can also indicate the source of the moisture if it is not readily apparent. Once the specifics are known, steps must then be taken to extract the salts from the stone, allow the stone to dry completely and then protect it from additional moisture. A major mistake that is often made—even by some professionals—is to apply a sealer to the stone or tile before the sub-florescence is completely resolved. Applying a sealer prematurely will not solve the subflorescence and will actually block the escape of moisture, making things even worse. Dealing with sub-florescence is really not a DIY project and it may take some time to achieve complete resolution, so it is important to contact your stone restoration expert as soon as the condition is noticed. 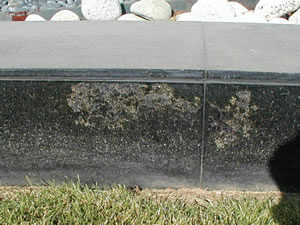 Be aware that efflorescence—a white haze or powdery residue on the surface of the stone —can be a precursor to sub-florescence, and an early warning sign. If you think your stone is showing signs of either condition, don’t hesitate to contact your stone restoration technician. Acting before the damage becomes severe can help you avoid having to replace rather than restore your stone.